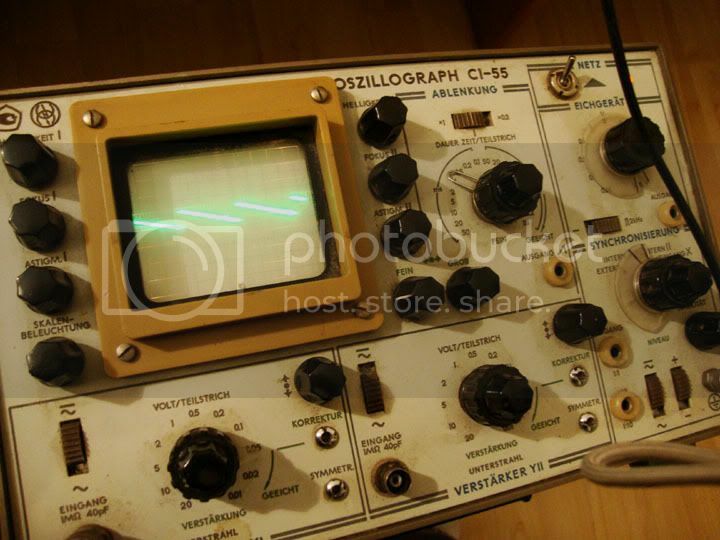 New Zealand Vintage Computer Forums • View topic - Oscilloscope thread. After reading about SpidersWeb's new toy, I think we need this thread here. I love seeing old scopes still doing useful work. This is a good idea. I'll snap a photo of mine on the weekend. Right, here are my scopes, and one little extra. Most of this gear was taken out of people's rubbish or bought broken, and fixed. That might explain the poor condition. Sorry about the mess. It isn't usually that bad! And that's just the oscilloscopes. Piles more test gear around. Valve testers too! Last edited by Clym5 on Thu Aug 07, 2014 9:22 pm, edited 1 time in total. This SO looks like stuff from my father-in-laws garage... He's got gear going back quite a few decades... I'll see if I can source a few piccies as well from there when I next visit. Last edited by kevman3d on Tue Jul 21, 2015 7:17 pm, edited 1 time in total. Before too long I will be clearing out some of the old equipment I have in storage. If anyone is interested, please let me know. Otherwise they will be put on TradeMe or thrown out. Appropriate to this thread is an Iwatsu SS-5705 40MHz analog scope, almost 30 years old. 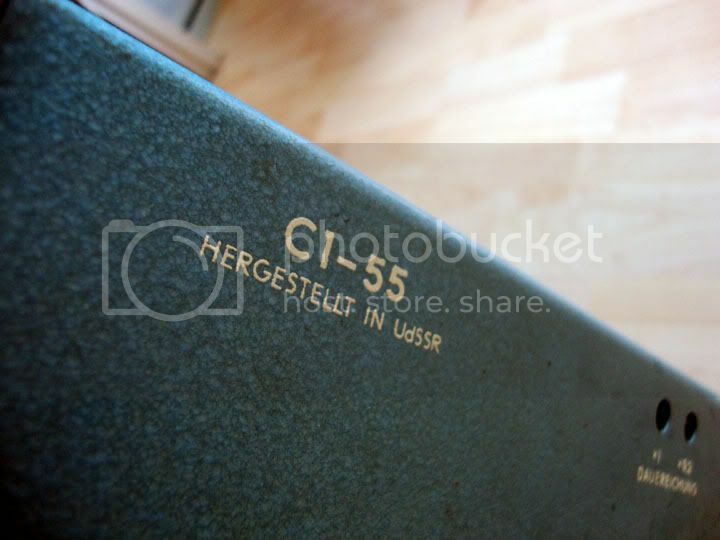 Was as new when packed away some years ago. Also a Thurlby Thandar DSA524 digital storage adapter which worked well with the Iwatsu scope. Should still be in good working condition. Probably more than 20 years old. 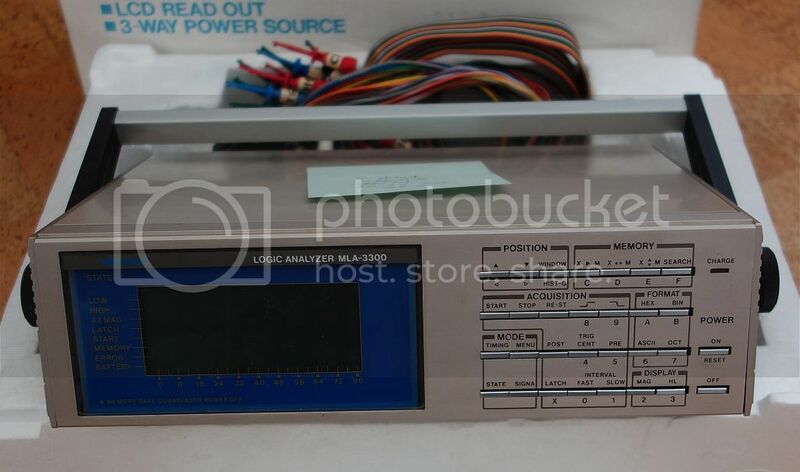 More unusual is a 16-channel Meguro MLA-3300 logic analyzer with LCD display and battery or mains power. The NiCad batteries have been removed, and I haven't tried powering it up, but it worked last time I tried. Not a very fast analyzer, but practical when you don't want to earth the unit under test. Almost 30 years old. Packed away is also a Link Instruments LA-4580-128K 80-channel logic analyzer controlled by a DOS PC. Can't find the ISA card to control it at the moment, but I must have it somewhere. The software may still be available from Link Instruments or somewhere else online, and I probably have the original disks somewhere. Could be free to a good home, anyone who will collect or pay freight, and will promise not to on-sell to make a quick profit. (If this should be in the for sale forum, my apologies. Feel free to move it.). 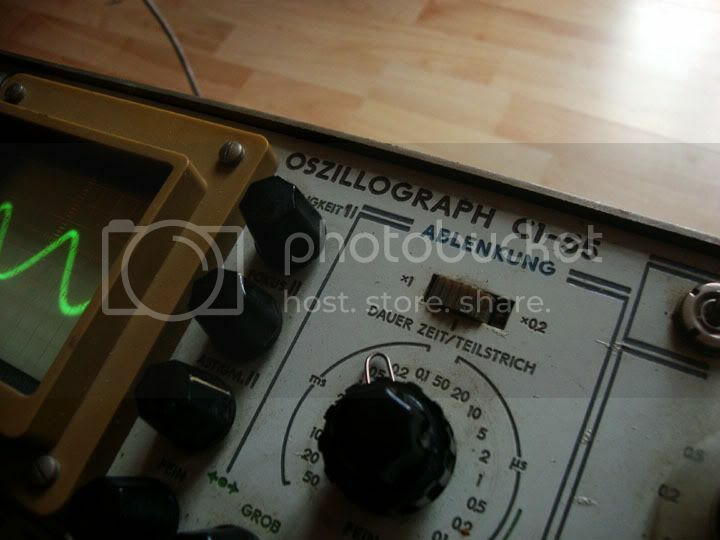 The only one which can be used as a stand-alone oscilloscope is the Iwatsu. The Thurlby Thandar one needs an analogue scope to show the digital storage signals, and the Meguro is a logic analyzer rather than a scope. Digital signals only. A photo of the Meguro Logic Analyzer before it goes off to a new home. Purchased new in May 1986 for $2900 at (I think) G.T.S. in New North Road, Kingsland. I still have the invoice somewhere. Here's my new one. This could also go in the "garbage find" thread because, yep, I saved it from getting thrown away. It works fine! It's a full-on spec analyser with a ton of features and options. Late '70s/early '80s vintage. Big, heavy beast, 4U deep rack size but doesn't have rack ears. This is almost too much scope for my piddly little home-builds, but it is awesome, and mighty. ^^ love the pull-out instruction card on the front. HP really thought that through. I also grabbed its companion "logic pattern generator" - honestly I have a vague idea what this does, but *no* idea what I'd use it for. Seemed too cool/interesting to let get thrown away. I'm gonna let this one go if I find it a good home. Has anyone used one of these in a professional environment? What do you do with them? I used pattern generators when doing embedded software development work on consumer equipment such as cassette tape decks, turntables, and telephones. 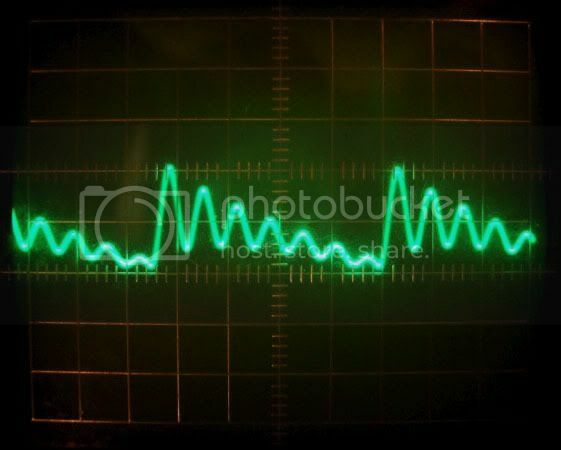 Good for simulating signals from peripherals which may not be ready for testing, or for creating extreme cases which might not be easy to achieve in reality, such as the varying speeds of signals. Later I used PLCs to generate signals or patterns dependent on input signals received, which could produce more realistic data than simple pattern generators. Which reminds me of a story from the early days of video cassette recorders, about 35 years ago. I worked for a smaller manufacturer who purchased the tape units from a large manufacturer, adding their own exterior design, and remote control codes to make them compatible with their TV remotes. In one instance the large manufacturer was stubborn, and would not help us with information about the workings of their remote control receiver, and how it communicated with the drive unit. They wanted us to convert our remote control codes to their codes, and then forward those to their processor. We wanted to replace their processor, mainly to reduce the delays inherent in conversion and retransmission. So the only option was to read and disassemble the contents of their chip. While doing this I found a serious bug. If the user pressed the Stop button just as the tape reached the end-of-tape marker the program would go into an endless loop, requiring a power off and on again to continue using the tape deck. It wasn't easy to recreate as there was only a short window of opportunity. Maybe once in every 5 attempts when you were deliberately trying to recreate it. Most users would never have experienced it. It turned out that the manufacturer knew about this problem, had had two guys working on it for several months, and had accepted that there was no fix possible. The managers where rather gobsmacked when we demonstrated a unit working with our remote control codes, replacing their processor, and with the bug fixed. They had to send out a technical notice to their customers about the problem. The two programming guys were moved to another unit within the company. 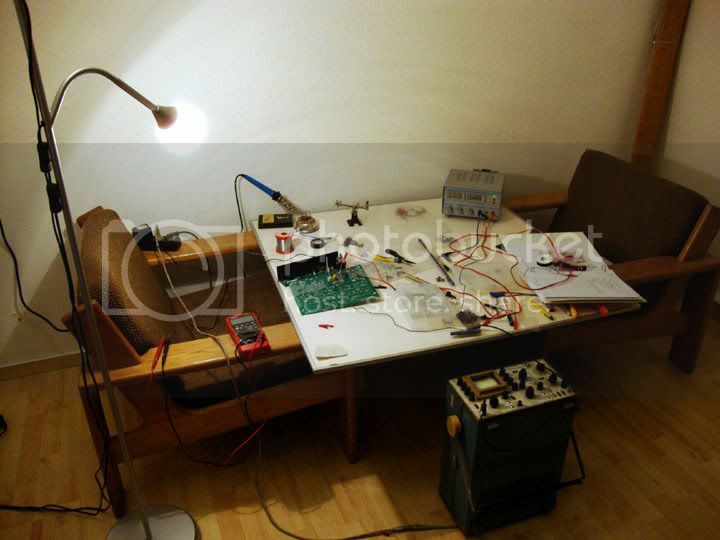 A pattern generator can be useful in a case like this, as the relative timing of the various signals simulating remote control, tape end marker, tape counter, and others, can be varied as required. Thanks for rescuing those two old pieces of HP test gear. It's heartbreaking to hear of what gets thrown in the rubbish, and nice to hear when someone saves something from destruction. Both of those items are very thin on the ground. Some old HP test gear still commands a high price even though there's plenty of it around because it's still very useful - 8640B signal generators spring to mind - plenty of them about as every NZPO radio depot had at least one, along with MoD and airways etc. Other items are still in demand just because they're soooooo high quality - like the 8662 sig gen which is hard to beat with a brand new sig gen. Your 3582A is interesting as it is an early example of a CPU controlled spectrum analyser (with FFT features etc), but not in high demand as it is very low frequency only and easily replicated these days by a sound card and software. The poor 8170A is unfortunately of little use now (and not a particularly sought after item when new), so not many people would be interested in it and it's value is less than what it would cost to ship it between towns. I'd love it, because it comes from the HP era I concentrate on, so if it ever starts getting in your way, just LMK! Hey Andy, thanks for the reply! Interesting info. I have some use for the spec analyzer building kits & fixing old synths (although it's way more instrument than I need!) but very little idea what to do with the 8170. It was more a case of "that's not getting thrown out on MY watch!" - but I don't regret grabbing it at all. I don't even want to think about what these cost new - tens of thousands I'm guessing?? Honestly I'd love to see one or both of these off to a good home of someone who knows HP gear, and from the looks of your sig yours would be a great one! Unfortunately I'm in Vancouver (North America) these days & doubt freight on these heavy beasts would be worthwhile. If you're *super* keen I'd be happy to price out a shipping quote, but it's probably not gonna be cheap. 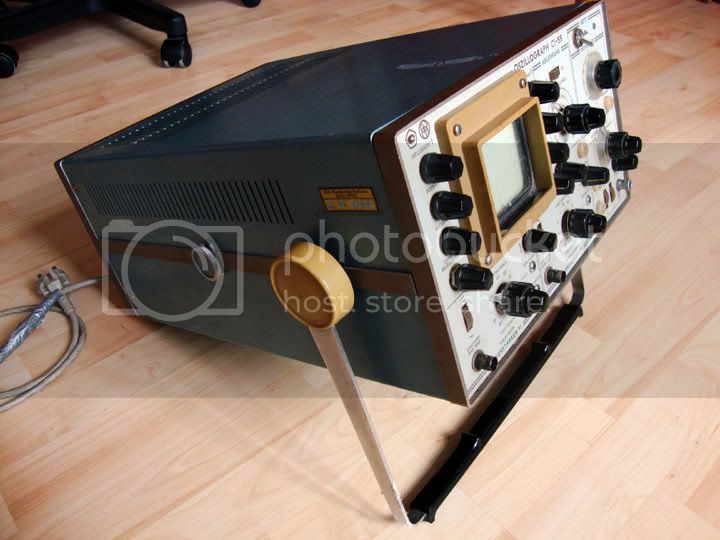 The pattern generator isn't as bad, it's maybe 10~12kg but the spec analyzer is at least 25.
andyg wrote: ...plenty of them about as every NZPO radio depot had at least one, along with MoD and Airways etc. Heh - saw a pile of kit outside the refurbished workshop today and rescued a Pye Linesmans phone, which was in extremely good condition. I think I might wire it up to use in the garage. There was also a couple of big (6 or 8U) rack mount HP things - very retro looking. I'll grab some pics tomorrow and see if there is any interest. xjas wrote: Hey Andy, thanks for the reply! Interesting info. I have some use for the spec analyzer building kits & fixing old synths (although it's way more instrument than I need!) but very little idea what to do with the 8170. It was more a case of "that's not getting thrown out on MY watch!" - but I don't regret grabbing it at all. I don't even want to think about what these cost new - tens of thousands I'm guessing?? 8170A was US$7400 in basic config in 1988. The 3582A was a whopping US$12500. Maybe next time :^) You were pretty much spot on for the weight of both, BTW.